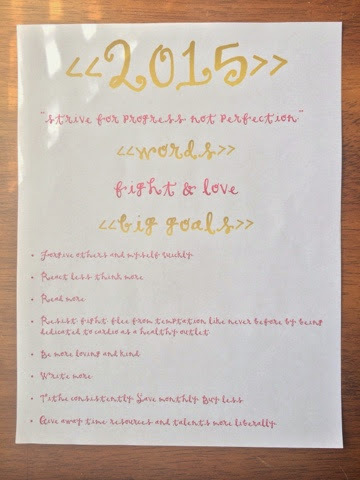 Well, it’s only January 10th, but FINALLY posting my 2015 goals. If I didn’t want to make them pretty, have them on a printout to post important places that was pretty, and do a 2014 recap post, I could have posted these LONG ago. But it’s still closer to January 1st than January 31st so we’ll call it a success. As I mentioned in the Goodbye, 2014 post, IT WAS A GREAT YEAR! And I’m full of confidence that 2015 will be too. I’ve never done a word, or words, for the year, but I saw some friends doing it and REALLY loved the idea. Ya’ll know I’m NEVER good at being concise, so obviously I couldn’t narrow it down to just one word. My words for this year are FIGHT and LOVE. At first glance the two may seen to be opposites, but for me they aren’t at all. FIGHT – I want to passionately fight for myself and along with the Holy Spirit for my best life. Not some American dream best life, but a really believing Jesus is better and the better way to live, life that glorifies that Lord, life. I want to fight to live a holy and pure life in every was possible. I want to fight against my human nature, the flesh, like never before. This involves many things, but the biggest for this year is replacing habitual sin with a healthy stress relieving outlet that has proven to be the most effective thing (along with regular intimate time with Jesus) for me consistently resisting temptation- working out. Allow me to add a little note and say, this isn’t about rules or law or legalism or shoulds or shouldn’ts. This is about seeing the evidence in my own life that choosing to live a life that glorifies God, isn’t captive to sin, and fights to be pure is genuinely a more life-giving and better way to live. FIGHT! LOVE – My human nature can be a B-word ya’ll. Living with roommates for the first time in four years is refining me like WHOA! At my worst I’m mean, selfish, caddy, snappy, and the list goes on. I want to REALLY strive to love the people I really do love, way better. I also want to love the people I don’t love (yet), my neighbors. God’s put me in this place for this time and I haven’t even met most of my dang neighbors! I also want to love my coworkers well, my friends well, my family well, and my gospel family well. LOVE! I want to fight to love and I want to love to fight! AND this year, I also copied my friend Megan, and added a goal for each month that are more specific ways to achieve my big goals. I love lists ya’ll. And I’m motivated by goals. January: Workout every day in January and beyond, goal – 66 days, not counting exclusion days. Exclusion(s): work + church Wednesdays and travelling days (for a wedding I’m making cakes for). Finish Let’s All Be Brave by Annie Downs. February: No drinking any sugar or artificial sugar. Exclusion(s): occasional hot cocoa on cold nights with roommates and pink coffee on Valentines Day. Finish Love Does by Bob Goff. March: Bring neighbors and landlord baked goods. Clean out closet. Finish I Want God by Lisa Whittle. April: Call a grandparent every Sunday. Finish 1000 Gifts. Make 32 things birthday list. Finish Make It Happen by Laura Casey. May: Do 32 things (TBD, but for sure plant things, FINALLY make my fairy garden, and load a Starbucks card to gift Instagram followers with coffee). Finish A Million Little Ways by Emily Freeman. June: Invite a different family from church to dinner every Thursday. July: Make ice cream in my barely used ice cream maker every Saturday. August: Write coworkers notes with a new school year survival happy. September: Memorize a chapter of scripture to cling to for November and the holidays. October: Bring neighbors and landlord pumpkin bread. Buy a stranger coffee every Monday at Starbucks (favorite month deserves a little cheer spreading!). November: Master a new baked good and TBD (hard month so will need extra). December: Send Christmas cards. Bring neighbors cookies. 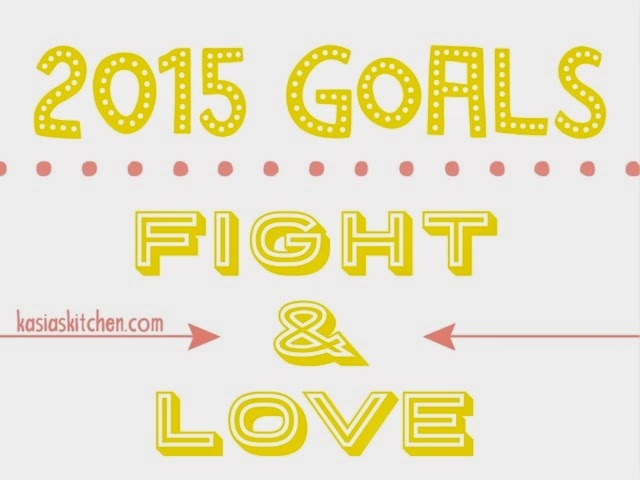 i love that you made yearly goals AND monthly goals too! good luck! Thank you! 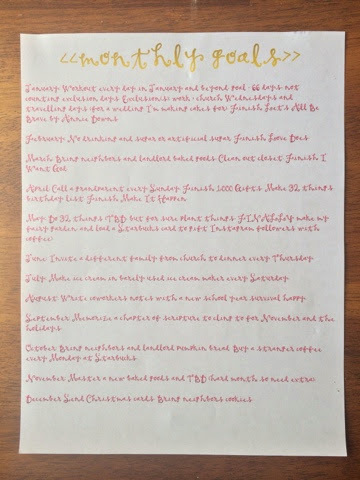 Lists motivate me, so I think the monthly makes it more practical and reachable for me!